Your rabbit should be vaccinated routinely against Viral Haemorrhage Disease (VHD) and Myxomatosis. Both these viral diseases can be rapidly fatal in an unvaccinated rabbit and there are no cures once infected. 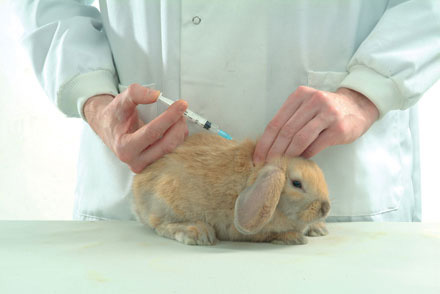 The only protection you can give your rabbit is by vaccination. VHD is spread by direct contact between rabbits (both wild and domesticated) but also via indirect contact such as from people, clothing, on shoes, other objects and fleas. Myxomatosis is spread mainly by fleas or other biting insects and is transmitted in this way from wild to pet rabbits. Myxomatosis and VHD are available in a combined vaccination which can be given as early as 5 weeks old and boosters are given 12 months. The main worms which affect rabbits are roundworms and tapeworms. The most common species of roundworm can also infect people. Children are the most likely to be infected and once the worms spread throughout the body, they can affect the eyes and cause blindness. Tapeworms are white or pale in colour and resemble flat segments filled with moving eggs that look like grains of rice. Rabbits are infected with tapeworm by swallowing fleas while grooming. Once inside your rabbit’s gut, the worm larvae carried by the flea develops into an adult worm that can grow to 5 metres in length! E.cuniculi is a parasite that lives inside cells and attacks the central nervous system and internal organs eg. kidney, heart, liver and lung. It is a very common parasite; approximately 50% of pet rabbits in the UK either have the parasite lying dormant (not causing disease) or have had the infection and cleared it. The spores of the parasite are shed in urine from all rabbits and rodents once infected. The spores are then spread in food and water that have been contaminated. Commonly the infection is passed from mother to young. As the infection does not always cause symptoms of disease then infection can spread without the owner knowing it. The most common symptom of E.cuniculi that we see in pet rabbits is a head tilt and falling over. Sometimes the symptoms are severe eg. seizures, but usually the symptoms can be managed. Some rabbits get cataracts (white discolouration of the eye), kidney disease and urinary incontinence. A blood test can be taken to look for antibodies against the parasite. However lots of rabbits that do not have symptoms of disease have antibodies against E.cuniculi so the test is not very accurate although it can be helpful in confirming a diagnosis. A test on the urine can also be taken to look for the parasite but by the time symptoms of the disease appear, the rabbit has usually stopped shedding the spores, so again it is not very accurate. Treatment is relatively simple, a drug call fenbendazole is given once a day for 28 days, by mouth. It comes in an easy to dose syringe called Panacur for Rabbits. Some rabbits may require steroids if the nerve damage is severe. Antibiotics may also be used. The best preventative measure we can currently recommend is a 9 day course of Panacur Paste (containing fenbendazole) every 6 months. If your rabbit has had E.cuniculi diagnosed previously, then treat every 3 months. If you are going to be moving house or getting a new rabbit then we recommend that you treat for 9 days again. If your rabbit gets ill, the last thing you want to worry about is the vet’s bill. Insurance is now available for rabbits and if the worst happens and your rabbit does get sick, insurance means we can do all that is necessary to treat your pet. Please don’t hesitate to contact the surgery regarding insurance.